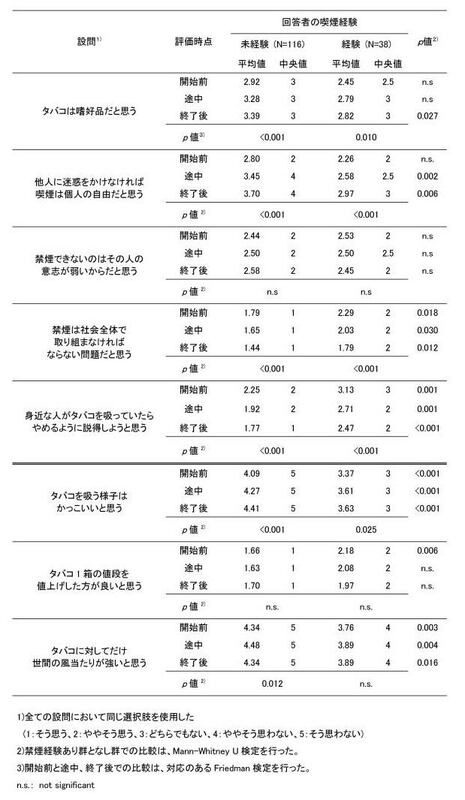 1) 日本循環器学会等合同研究班：禁煙ガイドライン. Circulation Journal 2005；69. Supple. ：1006-1103. 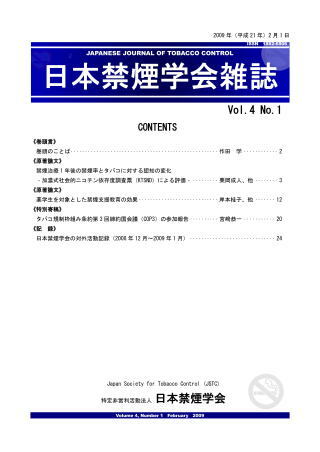 http://www.j-circ.or.jp/kinen/anti_smoke_std/anti_smoke_std_rev2.pdf　Accessed for Dec 27, 2007.
http://www.mhlw.go.jp/shingi/2008/07/dl/s0709-8k.pdf　Accessed for July 9, 2008. 9) Yoshii C, Kano M, Isomura T, et al: An Innovative Questionnaire Examining Psychological Nicotine Dependence, “The Kano Test for Social Nicotine Dependence (KTSND) ”. J UOEH 2006; 28 : 45-55. 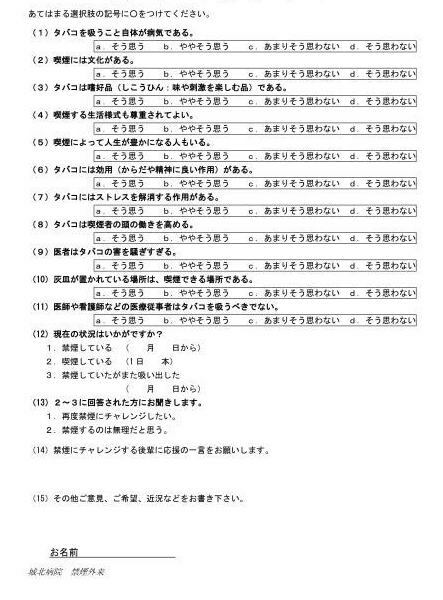 10) 吉井千春, 加濃正人, 稲垣幸司, ほか： 加濃式社会的ニコチン依存度調査票を用いた病院職員（福岡県内3病院）における社会的ニコチン依存の評価. 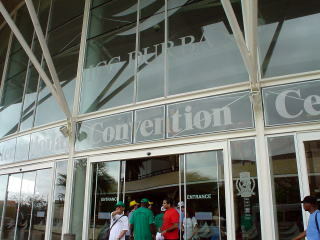 禁煙会誌　2007;2：6-9. 13) 栗岡成人，吉井千春，加濃正人：女子学生のタバコに対する意識　加濃式社会的ニコチン依存度調査票Version 2による解析．京都医会誌　2007；54：181-185. 15) 遠藤　明, 加濃正人, 吉井千春, ほか：中学生の喫煙に対する認識と禁煙教育の効果．禁煙会誌　2008；3：48-52. 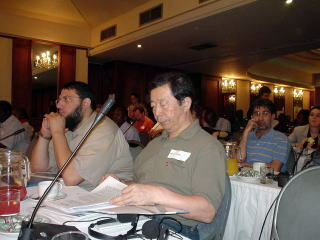 http://www.nosmoke55.jp/gakkai/200708/0708jstc_council.pdf　Accessed for Oct 26, 2008. Smoking cessation rate one-year after smoking cessation program and evaluation of smoker’s perception of smoking using the KTSND (The Kano Test for Social Nicotine Dependence) questionnaire. 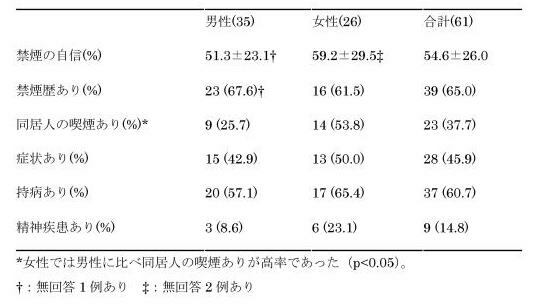 We evaluated sixty-one outpatients who visited the smoking cessation clinic at Johoku Hospital from April 1st 2006 to March 31st 2007. A 61 patients were composed of:is as follows: 35 male and 26 female patients, mean age 51.7 ± 13.2 (mean ± SD) ranging in age from 28 to 74 years old, Age of starting smoking 22.9 ± 8.2 ranged from 13 to 58 years old, number of cigarettes per day 27.6 ± 13.8 from 8 to 90, , smoking index(number of cigarettes per day×years of smoking) 767.2 ± 469.0 from 200 to 2520, TDS(Tobacco Dependence Screener) 7.8 ± 1.5 from 5 to 10, FTQ (Fagerström Tolerance Questionnaire) 6.1 ± 1.9 from 3 to 10, KTSND (The Kano Test for Social Nicotine Dependence ) 15.1 ± 4.9 from 3 to 28, CO concentration 25.5 ± 14.5 ppm from 4 to 78 ppm, The starting age of smoking was significantly higher in females and the smoking index and the scores on the KTSND were significantly lower in females. We regarded patients who reported they had quit smoking as successful and patients who reported they have continued or returned smoking or did not answer as unsuccessful. One-year after treatment the number of the patients who succeeded in quitting was 22, that is, the success rate one-year after treatment was 36.1%. Comparing the successful group to the unsuccessful group, the rate of family members who smoke was significantly higher in the unsuccessful group. The KTSND was used to evaluate the changes in the patient’s perception of smoking. The KTSND has 10 questions, which contain questions group on justifying the usefulness of smoking, neglecting the harm of smoking, regarding smoking as a cultural or personal preference. In the successful group, the KTSND score on positive perception of smoking was significantly lower after one year, especially on the group of questions on justifying the usefulness of smoking. 8) Yoshiko M., Mari I., Jun N.: Effects of Smoking Cessation Intervention Education in Dental Students. Tsurumi Univ. Dent. J 2007;33(2);47-54. 9) 八杉倫,西山緑,大石賢二:医療系大学における習慣的喫煙者と非喫煙者のライフスタイルとタバコに対する意識調査の検討. Dokkyo Journal of Medical Sciences 2007;34(3);221-229. 19) Toshiko O., Mikako A.: Influence of environmental factors on the smoking and smoking intention in high-school students of six prefectures in Japan. Jpn J Health and Human Ecology 2008;74(3);114-128. 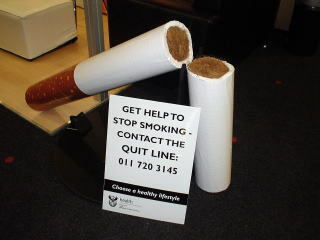 Effects of the education to help people stop smoking among the pharmacy students. 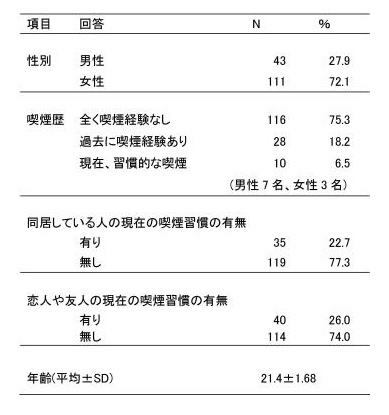 The education to help people stop smoking was executed for the third Keio University Faculty of Pharmacy grader. Though knowledge of the hazardous property of smoking is necessary, it was thought that it was also important to understand the social background that surrounded smoker and the smoker's psychology to do useful no smoking support. 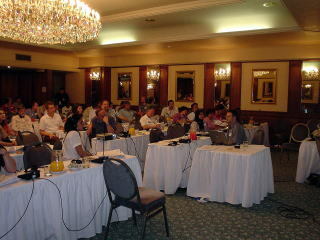 Then, the content of the lecture included both scientific sides and the social dimensions. 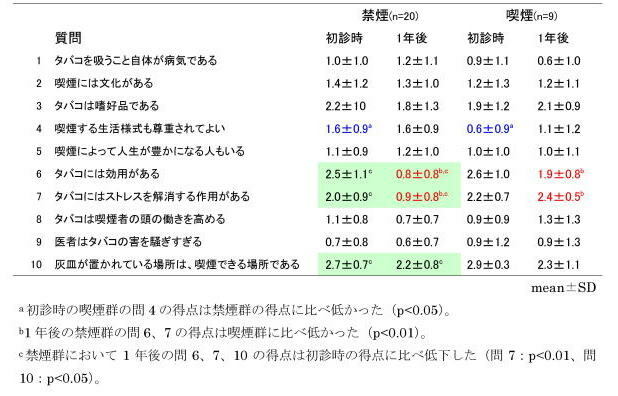 The questionnaires for view of smoking and no smoking support were executed gradually three times when before it teaches it, a scientific side and social dimension were each lectured in the first half and the latter half. It became clear that there were more smoker's lover and friend around smoker than nonsmoker. It was found that the difference was seen by the presence of the smoking experience in consideration concerning smoking from the questionnaire before the class is begun. This lecture was not able to change successfully the recognition that cigarette is luxury grocery items and the weakness of the will is a cause that it is not possible to stop smoking. But each content influenced consideration to smoking and the posture to the no smoking support was assumed to be the stronger one. 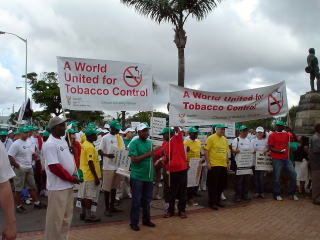 Copyright (C) 2009 Japan Society for Tobacco Control. All Rights Reserved.